Meet fellow Blogathoner Sue Dickman who blogs at A Life Divided (where I will have a guest post of my own posted). It's a bit of serendipity that we both love to cook and that she has ties to India, which I just found out as I read through her blog. She says if she's not in Mass., she's in India most likely...all I can say is what's not to love? It's a sad thing when a cookbook goes out of print. Even with so many fabulous recipes online, there are always recipes lost once they can only be found in the pages of a book no longer easily available. One of the out-of-print cookbooks I'm most sad about is Maya Kaimal's Savoring the Spice Coast of India. Before she became a jarred sauce maven, Maya Kaimal wrote two well-regarded cookbooks, first, Curried Favors and then Savoring the Spice Coast of India, both about Kerala, the southwestern Indian state where Kaimal's father is from. Savoring the Spice Coast came highly recommended by a friend, who said that the recipes were interesting and delicious and that they always came out as Kaimal said they would. High praise for a cookbook indeed! I bought a copy and began to cook from it myself and discovered she was right. The recipes are well thought out, relatively easy to make, and if Kaimal says it will take 40 minutes, it does. So, it was much to my dismay when I tried to buy a copy for a friend (the one I first visited Kerala with in 1990!) and discovered the book was out of print. It's a shame. There are so many sources for good North Indian food--Madhur Jaffrey alone provides hundreds of excellent recipes--but not so many for South Indian food. Kaimal's recipes are clear, easy to follow and don't require too many exotic ingredients. You may need to go to an Asian grocery store for curry leaves, but otherwise, most of the ingredients can be found in a well-stocked supermarket. I made this shrimp during the brief Maine shrimp season in New England, but you can use any small shrimp or cut up larger ones. The process is simple, but it moves quickly, so it makes sense to have everything all ready before you get started. I’m hoping that the book will find its way back into print someday. In the meantime, I’m going to do my small part to spread the word! Enjoy. 1. In a large nonstick pan heat the oil over medium-high heat. Add the mustard seeds and cover. When the seeds have popped, add the fenugreek seeds and fry until slightly browned. 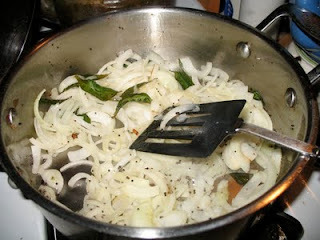 Add the curry leaves and after they crackle for a few seconds, put in the onions and fry until soft. 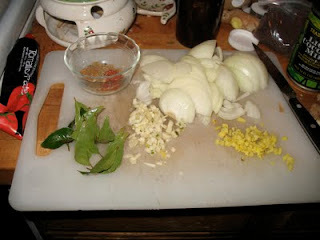 Stir in the garlic, ginger and green chilies and fry for 1 minute. Add the tomato paste, ground masala, and salt and fry for another minute. If the mixture dries out, sprinkle in a little water. Add 1/2 cup of the coconut milk and 1 cup water. Bring the mixture to a boil, reduce the heat and simmer, uncovered, over medium-high heat for 5-10 minutes to blend the flavors and thicken the sauce. 2. 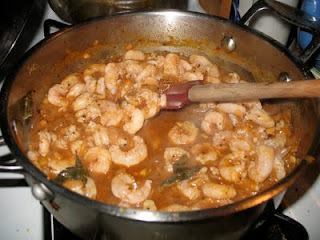 Put in the shrimp and stir constantly for 4-6 minutes or until the shrimp are opaque and cooked through. 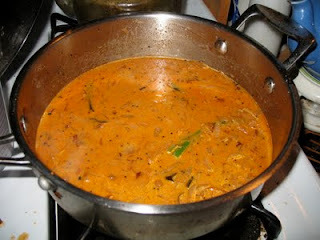 Add the remaining 1/4 cup of coconut milk, bring just to a boil, and removed from the heat. Taste for salt and serve immediately. Recipe may be prepared in advance through step 1. OMG, that looks good. The type is really tiny so it's hard to read but those photos and the recipe are making my mouth water. Thank you. Anjuli, totally GET what you mean about holding on to old cookbooks. Sometimes improvements are...well, are NOT. How yummy does this dish look?? I love shrimp and coconut milk.